Funding was approved for completion of the Interstate 49 Missouri-Arkansas Connector (Bella Vista Bypass) last month. Widening of the last four lane section of SR 210 in San Bernardino County will commenced this fall and run through Summer 2022. The upgrade will allow the remainder of SR 210 to finally become a part of Interstate 210. Legislation was just introduced to designate a portion of the Western Kentucky Parkway as Interstate 369. Signs for the William Natcher Parkway in Kentucky were changed to Interstate 165 starting on March 6, 2019. Updated California Interstate guides with new photos for I-105, I-205, I-305, I-405, I-605, I-110, I-710, I-280, I-380, I-580, I-680 and I-880. Interstate 980 California – updated guide with photos taken in 2013, 2015 and 2018. Interstate 459 Alabama – added photos from 06/09/17. Interstate 485 North Carolina – added photos from 2013-19 covering both exchanges with I-85. Interstate 555 Arkansas – updated covergae of both ends with photos taken 01/14/19. Interstate 565 Alabama – added photos from 06/10/17. Interstate 895 Virginia – updated end coverage with photos taken in 2012 and on 01/01/17 and 12/21/18. Interstate 195 Virginia – updated page with photos from 12/16/16, 12/31/16 and 01/04/19. Interstate 295 – Delaware Valley – added photos showing the new west end at Bristol, Pennsylvania (12/27/18). Interstate 395 Virginia – updated page with photos taken 12/16/16, 12/01/17, 12/21/18 and 01/04/19. Interstate 395 Virginia / District of Columbia – updated with photos taken 12/16/16 and 01/04/19. Interstate 276 Pennsylvania – updated with four photos (12/27/18) showing the new eastern end at the PA Turnpike/I-95 Interchange. Updated pages and added photos for I-210, I-310, I-510, I-610 and I-220 in Louisiana. Interstate 220 Mississippi – updated photos of both ends. Interstate 840 North Carolina – accelerated construction moves the completion date of the next section of the Greensboro Northern Loop to September 2019. Interstate 469 Indiana – added photos from both ends taken by Thomas Decker (03/07/16). Interstate 295 North Carolina – the addition of a tunnel for military vehicles into the design of the Fayetteville Outer Loop delayed completion of the section south to Cliffdale Road until Fall 2019. Interstate 795 Maryland – updated photos covering both ends (06/20/12). Interstate 795 North Carolina – a southern extension of I-795 to I-40 will start construction in 2027. Added photos from 12/14/17 and 12/21/18. Interstate 275 Tennessee – updated guide and added eight photos taken 11/03/11 and 06/10/17. Interstate 640 Tennessee – updated guide and added ten photos taken 11/03/11, 06/25/12 and 06/10/17. Interstate 895 New York – updated guide on the forthcoming Arthur Sheridan Enhancement Project which converts the freeway into an at-grade boulevard. Added new photos covering both ends from 12/17/17. Interstate 780 California – updated coverage of both ends. Interstate 39 – added five new photos of the south end (05/06/18). Interstate 41 – the bulk of work at the Zoo Interchange Project wraps up this summer and fall. Updated guide to reflect completion of the Brown County construction, and replaced photos at the north end (10/28/16 & 06/14/18). Interstate 43 – the I-39/90 Expansion Project upgrading the south end of I-43 commences this summer. Replaced coverage at the north end of I-43 with photos taken 10/28/16, 01/30/18, 02/02/18 and 06/14/18. 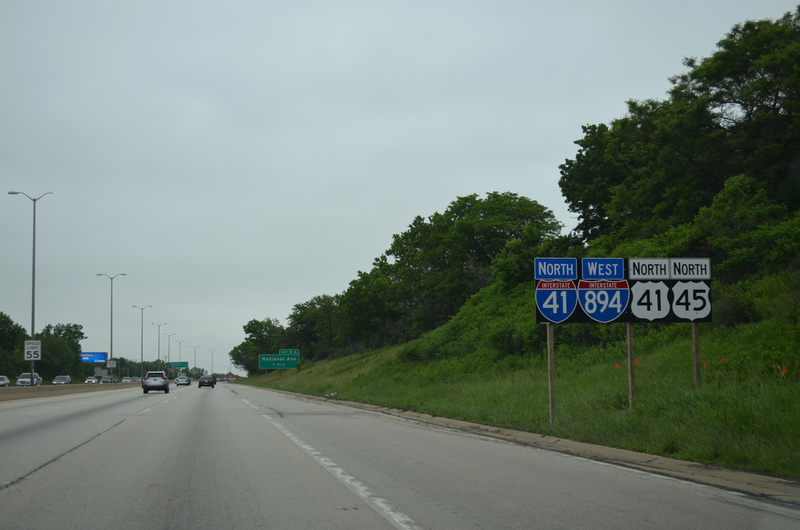 Interstate 94 – updated coverage of the west end with photos taken 08/07 and 08/08/16. Interstate 40 – updated photos covering both end points. Interstate 190 Illinois – the Cumberland Flyover project will be completed at the east end of I-190 this November. Interstate 215 California – updated coverage of both end points and added information on three improvement projects completed over the last five years. Interstate 74 – updated west end coverage. Interstate 88 (Western) – updated west end coverage. Interstate 155 Illinois – updated coverage of both end points (05/06 and 05/24/18). Interstate 170 Missouri – added three new photos at the north end and four at the south end (05/24/18). Interstate 255 Missouri / Illinois – updated coverage of the eastern terminus with 10 photos taken 05/28/18. Interstate 270 Missouri / Illinois updated east end coverage (05/06 and 05/24/18). Interstate 280 Iowa / Illinois – updated end coverage with photos taken 05/24 and 05/28/18. Interstate 474 Illinois – updated end coverage with photos taken 05/24/18. Interstate 11 – phase 1 of the Boulder City Bypass was completed on January 27, 2018. Interstate 269 – the latest section of the Memphis beltway opened to traffic on December 7, 2017 through Marshall and DeSoto counties. Interstate 285 North Carolina the FHWA finally approved I-285 along a 23-mile section of the U.S. 52 freeway from Lexington to Winston-Salem. Also added six photos showing the south and north end points from 12/15/16. Interstate 110 Texas – updated coverage of both end points with photos taken 04/25/17. Interstate 74 North Carolina – updated guide on progress for segments at Rockingham, Lumberton and Winston-Salem. Also added photos from 2010 to 2014 of the various end points across the state. Interstate 95 – sign changes will take place starting this month and running through late spring to redesignate current I-95 from Bristol, PA north to Lawrenceville, NJ as an extension of Interstate 295. I-95 shifts to the PA and NJ Turnpikes upon completion of the flyovers at the Bristol Interchange. Interstate 195 New Jersey – Exits at the west end of I-195 will be renumbered as part of changes for I-95/295 around Trenton. Also updated photos covering the western terminus (12/17 and 12/19/17). Interstate 295 Delaware / New Jersey – updated page with two new photos at the current north end at Trenton and two at the south end in Delaware (12/17). Interstate 140 North Carolina – I-140 opened to traffic between Leland and U.S. 421 on December 19, 2017. Added photos of both ends from December 31, 2017. Interstate 190 South Dakota – updated guide to reflect the completion of the I-190/Silver Street Interchange Project and added photos covering both end points from Joseph Barnes (12/13/17). Interstate 476 Pennsylvania – Updated coverage of the south end with photos taken today. Interstate 140 North Carolina – The final segment of I-140 is scheduled to open on December 15, 2017. Interstate 57 – AASHTO approved the establishment of Future I-57 along a 123-mile segment of U.S. 67 in Arkansas. Interstate 87 – updated coverage of the north end with photos taken by Shaun Ganley (03/18/15). Interstate 840 North Carolina – AASHTO pre-approved the next sections of the Greensboro Urban Loop scheduled to open next year. Also added photos of both ends taken 12/15/16. Interstate 840 Tennessee – added new photos covering both ends from 06/10 and 06/11/17. Interstate 165 Kentucky – AASHTO approved the designation of I-165 for the William H. Natcher Parkway. Interstate 678 New York – added a map scan from 1961 showing the original alignment proposed for I-678. Interstate 295 Massachusetts / Rhode Island – RIDOT will renumber all interchanges along I-295 to mileage based numbers later this fall. Added 1969 map scan and replaced some photos at both ends. Interstate 895 New York – With plans moving forward to convert the Sheridan Expressway into an urban arterial, AASHTO approved the elimination of I-895. Interstate 4 – updated coverage of the east end (05/24/17). Interstate 195 Florida – added two new photos of the east end (07/27/17). Interstate 395 Florida – updated page on the five-year project to rebuild the freeway starting in December, added/replaced photos covering both ends, and a map scan from 1970. Interstate 595 Florida – updated photos of the east end (01/24/16). Interstate 595 Maryland – updated photos of the east end (12/16/16 and 12/31/16). Interstate 235 Oklahoma – overhauled page with information on the Off Broadway project at I-44/235 and new photos covering both ends thanks to contributions by Eric Stuve. Interstate 240 Oklahoma – updated east end with photos taken by Eric Stuve (03/23/14), added information on the ongoing Crossroads Renewal 240 project with I-35, and posted three historical map scans. Interstate 244 Oklahoma – updated photos covering both ends (11/01-02/16), added two historical map scans and added information on two current bridge replacement projects. Interstate 444 Oklahoma – added new photos covering the remaining perspectives of each end point (11/01-02/16) and a map scan from 1971. Interstate 180 Illinois – updated page with new photos covering the north end (06/21/15). Interstate 515 Nevada – updated photos covering both ends of the route (07/13, 07/14, 07/15, 07/17), and added information for Interstate 11. Interstate 240 Oklahoma – updated history and replaced photos of both ends (05/06/12). Interstate 435 Kansas / Missouri – updated photos of both junctions with I-35 (06/18-19/15 and 10/31/16, 11/03/16). Interstate 11 – added photos showing recent construction of the Boulder City Bypass – Phase 1 and updated the status of I-11 through southern Nevada. Interstate 505 California – revised page with new photos taken between 2005 and 2015 and added two historic map scans. Interstate 515 Nevada – started a revamp of the page and updated south end coverage with four photos taken 07/12/15 and 07/21/17. Interstate 580 Nevada – the last section of the Carson City Freeway opened on August 2. Replaced photos at both ends showing the current configuration (08/04/13, 06/28/14, 07/17/17). Interstate 195 Rhode Island / Massachusetts revised page, added three map scans, and updated end coverage with photos taken by H.B. Elkins (05/31/13). Interstate 295 Maine – added two map scans. Interstate 495 Massachusetts – updated coverage at both ends with photos taken by H.B. Elkins (05/31 & 06/01/13). Interstate 196 Michigan – rewrote page, added three map scans and replaced 2001 photos with photos taken in 2009 and 2011. Interstate 390 New York – replaced three photos at the north end and four at the south end (01/18/17) and added a historic map scan from 1968. Interstate 490 New York – added three photos of the east end (01/17/17) and two of I-490 at Downtown (01/18/17). Greatly expanded history section to include the Western Gateway Project and more on the original construction of I-490. Added a map scan from 1961. Interstate 690 New York – construction starting this fall will add a new on-ramp from the New York State Fairgrounds to eliminate the temporary traffic light that operates along I-690 during the State Fair. Replaced four photos at the west end as well (01/17/17). Interstate 285 Georgia – added new photos of the south parent junction taken 06/30/17, the north parent junction from 07/02/17, and a 1984 map scan. Interstate 675 Georgia – updated north end coverage with four photos taken along I-285 east from 06/12/17 and three on west from 07/02/17. Added photos showing the completed I-75 South Metro Express Lanes and their ramps with I-675 as well. Interstate 22 – added six photos at the east end (10/08-09/16). Interstate 85 – all lanes of I-85 reopened through northeast Atlanta at the site of the bridge collapse on March 30, 2017. Interstate 759 Alabama – an arterial extension of I-759 east to U.S. 278 and 431 at East Gadsden was approved by ALDOT on April 3. Interstate 25 – replaced six photos at the northern terminus (08/07/16). Interstate 70 – the Central 70 Project will replace the 1964-viaduct through the Elyra and Swansea neighborhood in Denver with a below grade freeway with express toll lanes. Replaced photos covering the west end and added a historic map scan and several photos showcasing the route across Colorado. Interstate 76 (Western) – added two new photos of the west end (08/11/16) and a map scan from 1968. Interstate 225 Colorado – revised page, added photos of both ends (08/11/16) and two historic map scans. Interstate 270 Colorado – expanded history section, added two map scans and seven new photos (08/11/16). Interstate 315 Montana – added a map scan from 1968. Interstate 85 – an elevated stretch of I-85 in northeast Atlanta collapsed due to fire damage yesterday evening. The freeway is closed between I-75 (Downtown Connector) and the Georgia 400 freeway. Interstate 110 Florida – updated photos from I-10 east at I-110 (05/12/16). Interstate 110 Louisiana – added two historical maps and updated photo coverage of both end points. Interstate 110 Texas – The I-10 Connect Project currently under study will eliminate the lone interchange along I-110 and expand the approach to the port of entry. Also added a map scan from 1966 showing the International border change at Chamizal National Memorial. Interstate 470 Ohio / West Virginia – Added four historic map scans and replaced coverage of both ends with photos taken in May 2011 by Ian Ligget. Interstate 14 – the first 25 miles of IH 14 were announced by the Texas Transportation Commission for U.S. 190 between Fort Hood and IH 35. Interstate 99 – expanded history write-up and added three photos of the north end at Painted Post (01/17/17). Interstate 184 Idaho – updated page to correct the location of the eastern terminus and added/replaced photos at both ends (08/09/16). Interstate 395 Virginia / District of Columbia – ongoing construction expands the reversible HOV roadway in Northern Virginia to three lanes and converts them to express toll lanes. Additional work adds a platform above I-395 at Massachusetts Avenue as part of the Third Street Tunnel project. Both projects continue until 2019. Interstate 20 – replaced photos on I-95 south at the east end of I-20 (01/01/17). Interstate 85 – replaced photos from I-65 south at I-85 in Montgomery (10/09/16) and from I-95 south at I-85 (01/01/17). Interstate 295 North Carolina – the newest section of North Carolina 295 opened to traffic between the All American Freeway and Bragg Boulevard on December 2, 2016. Added new photos of the east end and photos of the current west end from 01/01/17. Interstate 76 (Eastern) – updated end photos at the west end (10/01/10) and east end (12/18/16). Interstate 80 – updated coverage of the east end with photos taken 12/19/16 and coverage of the west end with westbound coverage of I-80 in San Francisco taken 03/09/15. The Lewis and Clark (East End) Bridge opened to traffic on December 18, 2017. Now a toll bridge, the crossing links the Indiana and Kentucky sections of Interstate 265 as IN 265 and KY 841 respectively. Interstate 276 Pennsylvania – rewrote page, added a section on the PA Turnpike / I-95 Interchange, a historic map scan and updated photos of both ends (12/19 and 12/21/16). Interstate 476 Pennsylvania – updated photos at the south end (12/24/16) and a new photo of the Lehigh Tunnel. Also added information on the Scranton Beltway, scans of two I-476 brochures and two historical map. Interstate 81 – added a section on the current study underway to replace the viaduct system through Syracuse or demolish it with I-81 relocated around the city in place of Interstate 481. Interstate 126 South Carolina – added information on the Carolina Crossroads Project currently under study. Alternatives for I-126 extend the route west directly to Interstate 20. Also revised end coverage with photos taken between 2012 and 2016. Interstate 240 North Carolina – revised end coverage and added photos taken 12/31/13 and 10/23-24/15. Interstate 181 Tennessee – added three map scans. Interstate 481 New York – the belt route may be renumbered as part of the I-81 mainline. Also added three map scans. Interstate 581 Virginia – a new DDI at Valley View Boulevard opened to traffic on November 21. Added four photos from August 2013 and map scans from 1963 and 1967. Interstate 587 North Carolina – FHWA just approved the NCDOT application for the redesignation of U.S. 264 freeway east to Greenville. Also added two map scans showing the previous upgrades along the U.S. 264 corridor. Interstate 587 North Carolina – AASHTO approved the designation for the U.S. 264 freeway from Zebulon to Greenville. Interstate 587 New York – construction slated for 2019 will reconfigure the east end into a roundabout. Interstate 35 – added a scan of a 1961 Kansas Turnpike brochure. Interstate 49 – updated the status of several future I-49 projects, updated photo of the southern terminus in Lafayette and the original north end in Shreveport, and added new photos covering the northern terminus in Kansas City, Missouri. Interstate 229 Missouri – updated coverage from I-29 north at both ends of I-229 with photos taken on 11/03/16 and added a photo of the double deck freeway at Downtown. Interstate 135 Kansas – revamped page, added historical maps and updated coverage of both end points from 10/31/16 and 11/01/16. Interstate 235 Kansas – added three map scans, info on the I-235/Kellogg Avenue interchange upgrade and new photos of the termini. Interstate 335 Kansas – overhauled page with new end photos (06/15 and 10/16) and two map scans. Interstate 635 Kansas / Missouri – updated coverage of both ends with photos taken 06/15, 10/16 and 11/16. Interstate 470 Kansas – added/replaced photos of both termini and expanded coverage to include perspectives from the Oakland Expressway south and the Kansas Turnpike east. Interstate 470 Missouri – updated coverages of all west end perspectives and added/replaced three photos at the east end. Interstate 890 New York – work on the revamp of Exit 4 is substantially complete. Interstate Business Route 40 – work to upgrade the Business 40 freeway through Winston-Salem, North Carolina will decommission the Business Loop by 2020. Construction on Oklahoma City Boulevard, the former alignment of I-40, continues through 2018. Interstate 670 Kansas / Missouri – revised page and updated coverage of the east end. Interstate 69 – contractor payment issues involving work on Section 5 pushed the estimated completion date back from June to October 2017 or later. Interstate 470 Missouri – updated photos at the northern terminus in Independence. Interstate 75 – the majority of the reconstruction project through Dayton, Ohio is now complete. Interstate 275 – Indiana, Kentucky, Ohio – added a map scan and historical information for construction of the beltway through the Bluegrass State. Interstate 471 – greatly expanded history and added a map from 1973. Interstate 84 (Western) – updates the eastern terminus with photos taken in 2014, 2015 and 2016. Interstate 215 Utah – updated photos covering both ends of the Salt Lake City belt route. Interstate 43 – added new photos covering Interstate 43 north at I-41 showing the fully opened interchange between the two routes (08/30/16). Interstate 72 – revised page and added two photos of the west end taken 08/14/16 by Joseph Barnes. Interstate 229 Missouri – added/replaced photos of both ends from 06/18/15 and from Joseph Barnes (08/14/16). Interstate 155 Illinois – revised guide with a map scan and new photos taken at the north end by Joseph Barnes (08/13/16). Interstate 172 Illinois – added/replaced coverage at each end with photos taken by Joseph Barnes. Interstate 474 Illinois – updated end coverage with photos taken by Joseph Barnes (08/13 & 14/16), expanded the historical write-up and added two map scans. Completed sitewide revisions of the Business Route Guide. All business route listings were reviewed and updated to show their current status. Also added photos, updated mileage statistics (when data was available) and added map scans. Interstate 310 Mississippi – updated status of the proposed route, following setbacks due to a lawsuit five years ago. Interstate 244 Oklahoma – expanded history, added a map scan from 1971 and revamped the end coverage with photos taken 05/04 & 05/05/12. Interstate 444 Oklahoma – revised the history section and added a map scan and six photos from 05/05/12. Interstate Business Routes – Interstate 15 – updated listings for all routes between Escondido, CA and Shelby, MT. Interstate Business Routes – Interstate 80 – revised listings for all routes between Sacramento and Pine Bluffs, Wyoming and added two map scans. Interstate Business Routes – Interstate 90 – added four photos and updated the status of business loops throughout Montana, Wyoming and South Dakota from field observations taken last week. Interstate Business Routes – Interstate 94 – updated status of all Business Loops in Montana and North Dakota from last week’s road trip. Also added two photos. Interstate 279 Pennsylvania – revised guide, added a historical map scan and updated end photos. Interstate 295 North Carolina – the future I-295 opened west from U.S. 401 to NC 24 on August 11. Work will be underway on all remaining sections by 2020. Interstate 376 Pennsylvania – updated write-up, revised end photos and added historical map scans. Interstate 540 North Carolina – incorporated research from Brian LeBlanc’s Wake County Roads into the guide, updated the status of the TriEx Extension (Toll NC 540) and added three historical map scans. Interstate 579 Pennsylvania – a $26.4-million project starts next year to build a deck above I-579 at the former Civic Arena. Also overhauled the page with replacement photos and three map scans. Interstate 840 Tennessee – added information on the final approval of the I-840 designation along the entire length of SR 840 between Dickson and Lebanon. Interstate 278 New Jersey / New York – added information on the Goethals and Kosciuszko Bridge replacement projects and a map scan from 1961. Interstate 194 North Dakota – revamped page with expanded history and three map scans. Interstate 894 Wisconsin – updated east end coverage with four photos taken by Peter Johnson (07/05/16). Interstate 895 Maryland – a three year project commenced this week to rebuild the Patapso River Flats bridge. Work will result in lane closures initially and then two-way traffic. Interstate 78 – updated coverage at the western terminus with photos taken by Mark Moore (06/17 & 18/16). Interstate 190 South Dakota – updated coverage at both ends (08/12/13 and 08/20/14) and added information on the ongoing Silver Street Interchange Project. Interstate 15 – added in depth history on the I-15/15E separation in California, overhauled end coverage of both termini, with new photos added from 2013, 2014 and 2016. Interstate 41 – added photos at south end along I-41 south & 94 east and I-41 north & I-94 west (06/25/16). Interstate 115 Montana – added history and updated photos of both ends (07/05 & 07/16). Interstate 294 Illinos – updated photos at north end along I-294 (06/25/16). Interstate 315 Montana – revised page and updated photos of both ends (07/07/16). Interstate 22 – updated coverage for the eastern terminus in Birmingham (07/08/16). Interstate 91 – work at the Mixmaster Interchange in New Haven nears completion. Interstate 95 – the fifth northbound lane of the Pearl Harbor Memorial Bridge across the Quinnipiac River in New Haven, CT opens on August 22. This brings the span to ten overall lanes. Interstate 215 Utah – greatly expanded the history section. Interstate 37 – changes to the design for the new Harbor Bridge (U.S. 181) at Corpus Christi may result in at least 0.6 mile shortening of IH 37. Interstate 22 – the freeway is now complete in Alabama. Interstate 795 Florida – the southbound lanes of SR 9B opened to traffic from U.S. 1 to I-95 on June 12th. The northbound lanes opened on June 14th. Interstate 22 – the final segment of I-22 in Alabama opens on June 20 following a ribbon cutting ceremony. Interstate 795 Florida – Phase two of Florida 9B opens the weekend of June 10-11. Interstate 169 Kentucky – created page for the proposed designation of the southern portion of the Edward T. Breathitt Pennyrile Parkway between the I-69/Western Kentucky Parkway and I-24 south of Hopkinsville. Interstate 269 Mississippi and Tennessee – updated coverage of the temporary southern terminus at MS 302 (Trevor B. 05/26/2016). Interstate 565 Kentucky – created page for the proposed designation of the William H. Natcher (Green River) Parkway its entire length between Bowling Green and Owensboro. Interstate 42 – I-42 was selected by AASHTO as the designation in place of I-36 for the new Interstate corridor between Clayton and Morehead City, North Carolina. Interstate 87 – AASHTO approved I-87 as the new designation for the U.S. 64/17 corridor between Raleigh and Hampton Roads, Virginia in place of I-89. Interstate 269 Mississippi and Tennessee – the route now extends north to I-40 at Arlington, Tennessee in place of SR 385. Interstate 555 Arkansas – the 4.81 mile extension to AR 91 was approved by AASHTO. End coverage updated to show the new west end. Interstate 26 – added information on the selection of Alternative 4B as the preferred route of the I-26 Connector in Asheville. Interstate 69W Texas – added information for the construction of the interchange at Loop 20 & U.S. 59 (future IH-69W) and International Boulevard in Laredo. Interstate 240 North Carolina – added information on the selection of Alternative 4B as the preferred route of the I-26 Connector in Asheville. Interstate 355 Illinois – revised page, added photos at the south end taken 06/20/15 and a map scan from 1989 and updated information on the IL 53 extension. Interstate 14 – establishment of 25 miles of IH 14 in Texas from U.S. 190 Business in Copperas Cove to IH 35 in Belton submitted for the AASHTO Special Committee on U.S. Route Numbering meeting scheduled for May 24, 2016. Interstate 36 – new designation in North Carolina for the U.S. 70 corridor between I-40 near Garner and Morehead City. Application for Interstate status has been submitted for the AASHTO Special Committee on U.S. Route Numbering meeting scheduled for May 24, 2016. 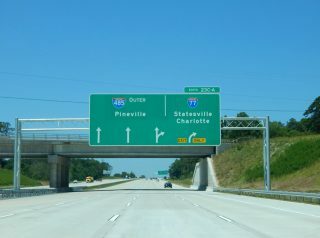 Interstate 89 – added information on the establishment of I-89 in North Carolina. The proposed route would run between I-40 in Raleigh east and north to Rocky Mount, Williamston, Windsor, and Elizabeth City, ending at the NC/VA state line. Application for Interstate status has been submitted for the AASHTO Special Committee on U.S. Route Numbering meeting scheduled for May 24, 2016. Interstate 269 Mississippi and Tennessee – extension of 19.176 miles of I-269 from the TN/MS border northward to I-40 near Arlington submitted for the AASHTO Special Committee on U.S. Route Numbering meeting scheduled for May 24, 2016. Interstate 555 Arkansas – extension of 4.81 miles of I-555 from U.S. 49 & AR 18 northward to AR 91 submitted for the AASHTO Special Committee on U.S. Route Numbering meeting scheduled for May 24, 2016. Interstate 57 – I-57 is the new designation given to the U.S. 67 freeway from Little Rock to Walnut Ridge per language inserted into the FY 2017 Transportation, Housing and Urban Development bill. Revised coverage of both end points as well. Interstate 275 Florida – added four photos of the northern terminus taken today. Interstate 535 Minnesota / Wisconsin – the Twin Ports Interchange project may commence in 2018 instead of 2032. Interstate 395 Maine – updated coverage of both ends with photos taken yesterday. Interstate 29 – added map and a section covering the previous route of I-29 along the west and north legs of the downtown loop in Kansas City, Missouri. Interstate 69 – Completion of Section 5 in Indiana is pushed back from October 2016 to June 2017 due to contractor delays and other issues. Interstate 71 – Phase 2D of the Columbus Crossroads Project at I-70 is delayed another year to 2018. Expanded history of the north end with another historic map while adding photos from I-90 east at I-71/490 taken 09/30/10. Interstate 77 – revised coverage of the south end with new photos taken on April 10. Added information on current construction to add Express toll Lanes north of Charlotte and an update to the Innerbelt Project at the north end. Also added two historic maps. Interstate 90 – expanded history section for Cleveland covering the unconstructed Parma Freeway, which would have taken I-90 north to the Shoreway. Interstate 95 – replaced two photos at the north end (04/11/15). Interstate 195 Florida – added/replaced six photos of the west end (01/24/16). Interstate 195 Maryland – revised page with more information, two maps, and 2012 coverage of the south end. Interstate 395 Maine – updated information on the I-395/Route 9 connector, a proposed two-lane limited access route between Brewer and Eddington. Added two maps and two photos taken 02/23/16. Interstate 490 Ohio – Added information on the Opportunity Corridor, a new boulevard extending from the east end of I-490 to University Circle. Also revised coverage of the west end with photos showing Clearview based signs (09/30/10). Interstate 895 Maryland – replaced photos at both ends (12/21/12 and 10/12/14) and added two historic map scans. Interstate 895 New York – efforts to tear down the Sheridan Expressway in the Bronx gain traction. Interstate 2 – exit numbers and mileposts were added by January 2016. Added two photos of the east end from 03/16/16. Interstate 69 – the corridor for Section 6 in Indiana was selected on March 29, 2016. Based upon funding sources, the route may be completed between 2022 and 2027. Interstate 69C Texas – added a photo at the south end (03/16/16). Interstate 69E Texas – added a map from 1983 and info on the Veterans International Bridge at Los Tomates. Interstate 69W Texas – added two photos from Laredo (03/16/16). Interstate 74 – replaced photos along I-74 west at I-80 (03/31/16). Interstate 80 – updated the west end to show new photos covering the approach from U.S. 101 north (03/27/16) and a San Francisco map scan form 1965. Interstate 88 (Western) – added new photos from I-80 west at I-88 taken on March 31. Interstate 110 California – added two photos of the north end (03/24/16) and two historic maps. Interstate 238 California – added three photos of both the north and south ends (03/27/16) and two map scans from 1971. Interstate 280 California – added/replaced five photos of the south end (03/25 & 27/16) and added two maps. Interstate 380 California – added/replaced seven photos of the east end and three of the west end (03/26/16) and added a map from 1966. Interstate 680 California – added/replaced three photos of the south end (03/27/16) and added two historical maps. Interstate 680 Nebraska / Iowa – replaced six photos at the west end and one photo at the east end with pics taken last week. Interstate 880 California – added/replaced three photos of the north end (03/27/16) and added a map of Oakland from 1977. Interstate 88 (Western) – added two historical maps. Interstate 380 Iowa – updated page to include new photos of the southern terminus and added two maps. Interstate 565 Alabama – replaced some of the westbound coverage with photos taken earlier this week by David Prince. Interstate 29 – updated coverage of the southern terminus and added information pertaining to Council Bluffs Interstate System Improvement Program. Interstate 74 – updated some of the end point coverage and expanded the write-up to include more information on the new Mississippi River Bridge and changes at the eastern terminus associated with the Mill Creek Expressway project. Added three historic maps and expanded history section on Illinois. Interstate 80 – added historic map of San Francisco and information about the alignment of I-80 at Omaha and Council Bluffs and upgrades made through eastern Nebraska in the 1990s. Interstate 129 Iowa / Nebraska – replaced photos at both ends and expanded the write-up covering the U.S. 75 Sioux City bypass and the planned Interstate 429. Interstate 180 Nebraska – added map scan from 1962. Interstate 235 Iowa – greatly expanded history write-up, updated photos covering both end points and added three map scans. Interstate 480 Nebraska / Iowa – revised entire guide with new end photos and historical maps. Also added a section on a 1999 proposal to extend the route south to Bellevue. Interstate 580 Nebraska – revamped photo coverage of both the historic and planned end points. Interstate 680 Nebraska / Iowa – greatly expanded history section, added a map from 1972 and updated photos covering both ends of the freeway. Interstate 280 Iowa / Illinois – expanded history section, added two historical map scans, updated some of the photos covering both ends (05/19 and 05/20/15). Interstate 555 Arkansas – a dedication ceremony will be held on March 11 in Jonesboro for the route. Interstate 35 – updated photos of the northern terminus (06/14/15) and added three historic maps showing original alignments from Des Moines to Albert Lea. Interstate 73 – funding for the Richmond Bypass, linking I-73 & 74 south of Ellerbe with U.S. 74 at Rockingham, was allocated by the NCDOT TIP for construction starting in 2022. Interstate 74 North Carolina – funding in the NCDOT TIP includes work to upgrade U.S. 74 to Interstate standards from the Richmond Bypass east to Hamlet in 2022. Interstate 394 Minnesota – updated coverage of both ends and added two map scans. Interstate 494 Minnesota – greatly revamped history, added two map scans and revised coverage of both end points. Interstate 694 Minnesota – expanded history section, added two map scans and updated photos of both ends. Interstate 20 – a four-year project to rebuild the I-20/59 viaduct system north of Downtown Birmingham moves into high gear later this year. Interstate 69E Texas – added six photos taken by Jeff Royston (01/27/16). Interstate 72 – a Marion County priority list includes upgrading seven miles of U.S. 36 as an extension of the Interstate. Interstate 169 Texas – the first sign for IH 169 was unveiled on February 16. Interstate 794 Wisconsin – the Hoan Bridge Project was completed in December 2015 and work is now underway at the Lake Interchange. Coverage at both ends was updated with photos taken by Peter Johnson on February 7. Interstate 240 Tennessee – revised the history section and added three map scans. Interstate 440 North Carolina – revised the write-up and added two map scans. Interstate 440 Tennessee – added more historical information and two map scans. The FHWA Route Log and Finder List was updated on January 27. All mileages on Interstate-Guide were verified or updated accordingly. Interstate 275 Michigan – added two map scans, more to the history section and end photos from 2009 and 2011. Interstate 475 Michigan – revised page with more historical information, two maps, and end photos taken in 2009. Interstate 696 Michigan – added two map scans and newer end coverage from 2009 and 2011. Interstate 26 – construction on the I-26 Connector in Asheville was moved up one year. Also expanded the history section for both South and North Carolina. Interstate 73 – the next section of I-73, the U.S. 220/NC 68 connector, will be completed by December 2016 instead of April 2017. Interstate 85 – the initial portion of the Montgomery Outer Loop (future I-85) opened on January 26th in Alabama. Also greatly expanded the history section for South Carolina with a more in depth look at the I-85 relocation north of Spartanburg. Interstate 185 South Carolina – expanded history covering the Southern Connector and updated both end sections with photos taken this month. Interstate 375 Michigan – potential plans to convert the freeway into a surface boulevard are placed on hold indefinitely. Also added two historial maps to the guide. Interstate 385 South Carolina – added new north end photos taken 12/31/13 and two historical maps. 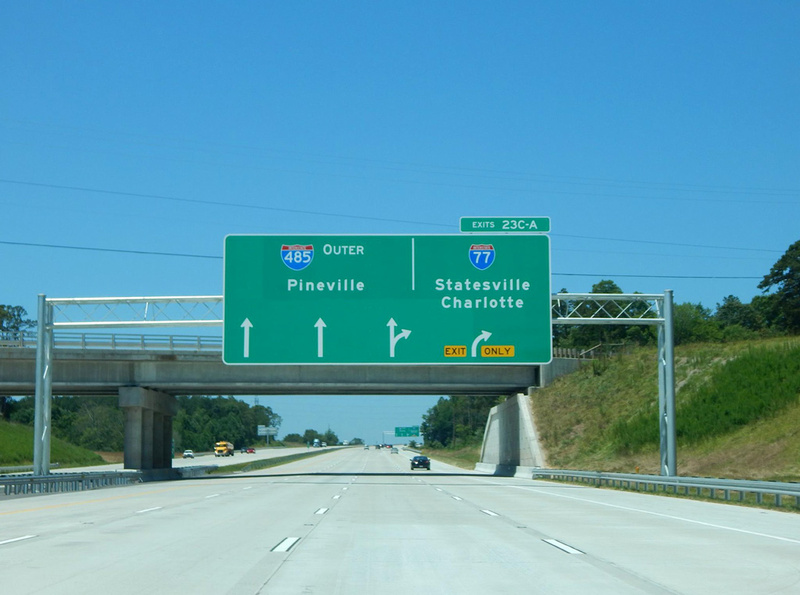 Interstate 585 South Carolina – revised entire guide and updated photos of both ends. Interstate 85 – expanded history section to cover early alignments proposed for Interstate 85 through northeastern Georgia. Interstate 124 Tennessee – Major reconstruction along Interstate 124 & U.S. 27 by Downtown Chattanooga is underway. The project modernizes a 2.3-mile stretch of freeway through July 2019. Updated the page also to include more background information on I-124, end photos taken in 2012 and 2013 and historical maps. Interstate 295 Delaware / New Jersey – updated guide to reflect the future extension west to Bristol, Pennsylvania and added sections covering the multi-year project to upgrade the I-76/295 junction and replace the Scudder Falls Bridge across the Delaware River. Added three historical maps as well. Interstate 65 – added two photos of the new Abraham Lincoln Bridge taken by Tom Reaugh on December 5, 2015. Interstate 464 Virginia – added new photos (10/12/14) of the north and south end, expanded the history section and added a map from 1987. Interstate 664 Virginia – revamped history of the freeway and the Monitor Merrimack Memorial Bridge Tunnel. Updated photos of the north end (10/12/14) and added two historical maps. Interstate 64 – added historical information and a map covering the original northern alignment planned for I-64 from St. Louis to Louisville by way of Vincennes. Interstate 264 Virginia – added two historical maps, two photos of the west end and revised the writeup to include information on the tolling of the Downtown Tunnel. Interstate 495 Delaware – revised page write-up and added a map from 1970. Interstate 14 – the FAST Transportation Act formally designates the Central Texas Corridor (U.S. 190) as I-14. Interstate 65 – the new Abraham Lincoln Bridge across the Ohio River opened to traffic on December 6. Interstate 69 – Section 4 of I-69 between Crane and Bloomington opened to traffic on December 9. Interstate 555 Arkansas – provisions in the FAST Transportation Act will allow for the full signing of I-555. Interstate 35E / 35W Minnesota – the MnPASS lanes on I-35E opened on November 30. Also updated page to include new photos of both ends (06/15). Interstate 555 Arkansas – the Arkansas State Highway Commission voted to upgrade I-555 from Future status. Interstate 65 – replaced photos at the south end (11/14). Interstate 110 Florida – replaced photos at both ends (11/15). Interstate 165 Alabama – replaced photos at both ends (11/14 and 11/15). Interstate 110 Mississippi – overhauled page with new coverage of both end points and updated information on the completion I-10/110 Interchange Improvements Project. Interstate 178 Pennsylvania – the American Parkway bridge across the Lehigh River opened to traffic on November 24. The parkway was built in place of the original Interstate spur. Turnpikes and Tollways – added list of Interstate highways with Express Toll or HO/T Lanes. Interstate 12 and Interstate 59 – updated their joint termini with photos taken 05/19/14 and 05/09/15. Also replaced some coverage of the north end of I-59 and all coverage of the I-12 western terminus. Interstate 16 – added information involving a study to remove the I-16 ramps to Downtown Savannah and updated photos at both ends. Interstate 185 Georgia – revamped page with two new maps and newer photos of the north end (2010 and 2012). Interstate 475 Georgia – added map and new photos of both ends. Interstate 516 Georgia – added two maps, info on the Project DeRenne project, and new photos of both termini. Interstate 520 Georgia / South Carolina – overhauled page with more historical information, maps and newer photos of both ends. Interstate 675 Georgia – updated photos of both ends, added information pertaining to two projects related to the termini. Interstate 985 Georgia – updated page with a new map and photos covering both ends. Interstate 39 – revamped coverage of the northern terminus and added information on the I-39/90 Expansion Project taking place in south central Wisconsin. Interstate 41 – begin signage posted for I-41 on 11/05 reaffirms that the Lineville Road interchange on the Howard and Suamico city line is the northern terminus. Readjusted the page to reflect that and added photos from 06/13/15 covering the southern terminus. Interstate 43 – added seven new photos at the north end taken 11/03 and 11/05/15. Interstate 535 Minnesota / Wisconsin – overhauled page with new photos of both ends, maps and more detailed historical information. Interstate 794 Wisconsin – updated guide to include new photos, maps and detailed historical information on Lake Parkway (STH-794). Interstate 894 Wisconsin – revamped entire guide, adding new photos of both ends, historical maps and a more detailed history. Interstate 22 to be formerly recognized in Mississippi at a ceremony held on October 23. Added 1980 map to Interstate 240 North Carolina and updated information pertaining to the I-26 Connector, which is now slated for construction starting in 2021. Interstate 269 Mississippi and Tennessee – a five-mile section opens south from TN 385 to MS 302 on October 23. The LBJ Express toll lanes opened to traffic on IH 635 in Dallas on September 10, 2015. Added maps and revised the history sections of Interstate 129, I-229 in Missouri, Interstate 435, I-470 in Missouri, I-470 in Kansas and I-635 at Kansas City. Updated photos at the northern terminus of Interstate 29 with images taken 06/16/15. Revamped photos of both ends of Interstate 229 in South Dakota with photos taken 06/17/15 and by Joseph Barnes (06/04/15). Updated and expanded write-ups and added maps for Interstates H1, H2, H3, H201, 2, 69C, 69E and 69W. Updated and expanded write-ups and added maps for Interstates 4, 5, 8, 12, 15, 16, 17, 19, 26 and 29. Updated and expanded write-ups and added maps for Interstates 27, 35E/W in Minnesota, 35E/W in Texas, 37 and 39. Updated guides for Interstates 41 and 43, with photos contributed by Peter Johnson on June 17, 2015. Revised write-ups and added maps to Interstates 45, 49, 55, 57, 59, 65, 69, 69, 71, 73, 75, 77 and 79. Revised write-ups and added maps to all two-digit Interstate routes ending in zero, all even numbered two-digits routes from I-64 to I-96, and Interstates 4, 24, 44 and 64. Revised write-ups and added maps to Interstates 81, 83, 85, 87, 89, 91, 93, 97, 99 and 595 in Maryland. Interstate 95 – per AASHTO, Interstate 295 will be extended west from Trenton over the former I-95 alignment once the I-95 / Pennsylvania Turnpike interchange is completed. Interstate 22 – AASHTO approves Interstate 22 for 106.7 miles of the U.S. 78 freeway in Mississippi. Interstate 69 – AASHTO approves two new segments in Kentucky along the Purchase and Pennyrile Parkways. Additionally completion of Segment 4 in Indiana is expected by late 2015. AASHTO approved the new designation of Interstate 169 in Brownsville, Texas. Interstate 840 Tennessee – AASHTO approves the redesignation of Tennessee 840 to Interstate 840 pending resubmital of the application with the proper designation (TDOT submitted SR 840 instead of I-840). Interstate 485 North Carolina – the final 5.7 miles of I-485 opens on June 5. Interstate 41 – the first signs for Interstate 41 are installed at Ashwaubenon, Wisconsin. Interstate 175 Georgia – created page. Intestate 580 Nebraska – added a more detailed history for the North Freeway and map scans from 1968 and 1980. The FHWA Route Log and Finder List was updated on December 31, 2014. All mileage statistics were updated here to reflect the new figures (except for Maine, where pre-2004 mileage is still reflected, and other routes with notable issues such as for I-26 in Tennessee). Interstates 41 north & 894 west at West Allis, Wisconsin. Photo taken 06/13/15. Interstate 41 was signed in Wisconsin starting in May 2015. Heading west along the outer loop of Interstate 485 ahead of Interstate 77 on the north side of Charlotte. Photo taken by Carter Buchanan (06/21/15). Interstate 485 in North Carolina was completed on June 5, 2015 after 40 years of planning and construction.